After you've created a slide and added some basic content, such as text, shapes, images, and characters, you're ready for the next step: adding animations and narration, then syncing the two. Watch the video first, then follow the steps below to practice. Download these practice files to follow along. Insert a new slide and select the blank layout. Right-click on the slide and select Format Background. Use the Picture or texture fill option to set cityscape.jpg from the downloads folder as the background image. 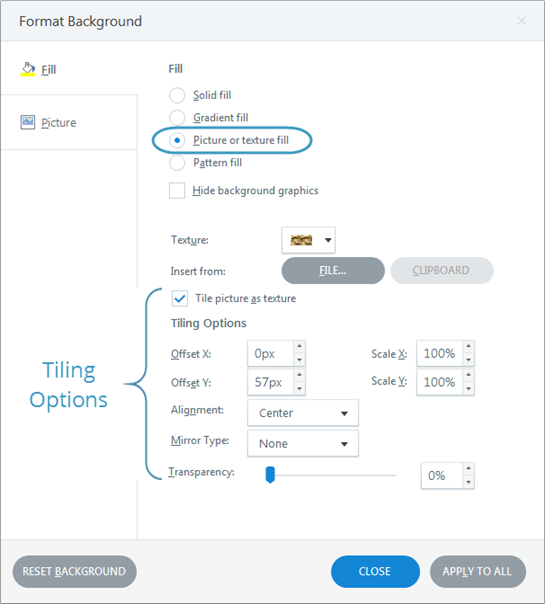 Use the Tiling Options to adjust the picture alignment the way you want it. To soften the background image, insert a rectangle. Right-click the rectangle and select Format Shape. Line color: Select no line color. Fill: Use the Eyedropper tool to select a dark color from the background picture. 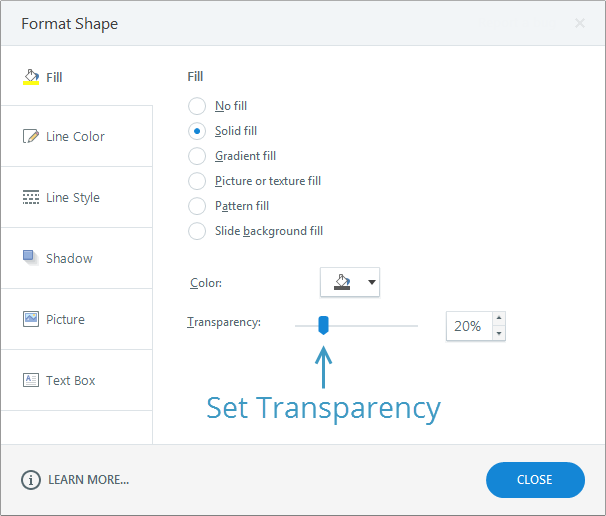 Fill: Set to 20% transparent. Size and position the rectangle to cover the entire slide. Crop and pose the character however you like. 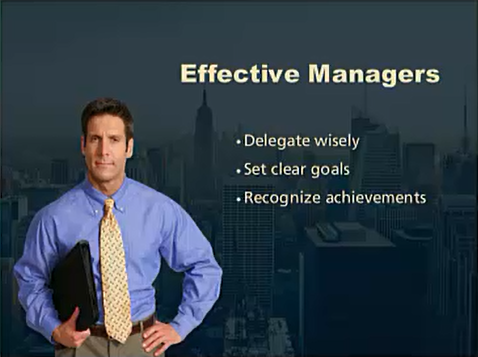 Add a text box for the slide title: Effective Managers. Format the title to your liking. Add some body text with three paragraphs: Delegate wisely, Set clear goals, Recognize Achievements. Format the text to change the color, add bullet points, increase the line spacing, and anything else you want to do. You should have a screen that looks something like the one below. Next, let's animate the text, add an audio track, and then sync the audio to the animated text. Select the bullet-point text box and go to the Animations tab. Set the Entrance Animation to Fade and use the Effect Options button to Sequence the text By Paragraph. This will set the paragraphs to appear one by one. Go to the timeline. Notice that the text box now has a little arrow next to it. When you click the arrow, it expands the title box and shows each individual paragraph of text. Go to the Insert tab on the ribbon. Click Audio and choose Audio from File. Select Effective-managers.mp3 from your assets folder. You should see the audio track on the timeline. Now we’ll add some Cue Points to the timeline so it’s easy to sync the animations to the audio. While playing the audio, you can set a cue point at the beginning of each sentence by pressing the C key wherever you want. Don’t worry about perfection here, because you can always move them around later. Each time you hit the C key, a cue point is added to the timeline. Now we’ll move the paragraphs along the timeline to the individual cue points. 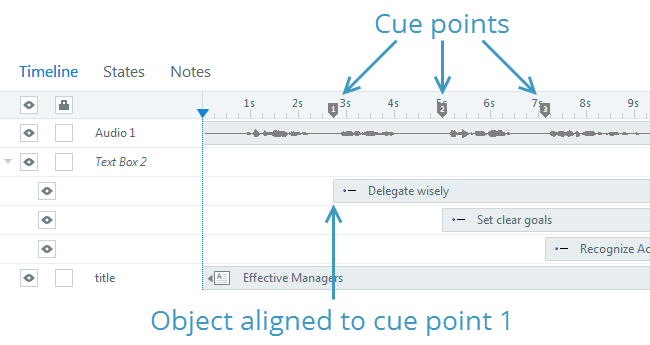 You can manually slide them to the cue points, or right click and Align to Cue Point. When you’re done, Preview the slide. You should hear the audio and see the text animate in on cue. Those are the basics of syncing animations to your audio. Any objects you add to the screen can be moved along the timeline to create entrance and exit points. And from the Animation tab on the ribbon, you can add entrance and exit animations. Now you know how to add and edit content such as text, shapes, and photographic characters. You also learned how to use the timeline to control the appearance of objects on the screen and sync animations to audio using cue points. In the next tutorial, we’ll show you how to import a PowerPoint file.